Dr. Kevin Goyke wants to help you live your best life with safe and effective chiropractic care! Our friendly and caring team will take the time to listen to your health needs and goals and help get you on the path toward optimal wellness! Get the specific attention you need to restore your health. Free consultations are available so that you can find out what we can do for you. Contact us today! We are open late and offer Saturday appointments. I highly recommend Dr. Goyke, he is a true professional and was able to heal my injury quickly. Dr. Goyke is a real pleasure to work with. He has a calmness to his voice, and he listens and assures you that he can help restore to your optimum health. Also, his hours are very flexible, and convenient. I am very happy that I found his office, and will continue to see him as long as needed. Goyke Health Center has been an intricate part in my fibromyalgia pain relief as well as he has greatly increased my overall flexibility. I highly recommend this health center to all my friends and family! I became a patient of Dr Goyke’s about a year ago. I have always had chronic problems with my neck, shoulders and back. My symptoms became worse due to extensive business travel. Since being a patient of Dr Goyke’s my pain has diminished and my overall health much improved. I went in all locked up in my neck and upper back, leaving I felt like the Tinman and somebody had found my oil can! Goyke Health Center is a very professional and clean office. They have short wait times and a friendly staff. Dr. Goyke has helped both my husband and I with separate issues. I had tennis elbow and with laser treatment I was back on the court in a month. The office is very inviting and relaxing and the staff has always been very nice. The girls are very accommodating in getting appointments scheduled that are convenient for me. I feel very comfortable at this practice. My first and second visits were awesome. Feeling better already. Thanks doctor! Dr. Goyke was very helpful and accommodating! I came in as a new patient and he was willing to see me right away. After the adjustment, I felt immediately better, and my headache went away. I experienced no aches and pains after the procedures and feel less achy in my upper back. I am excited! Thank you! I have been going to chiropractors throughout my life. They are definitely not all created equal, but I am very pleased with Dr Goyke. He is friendly and puts you at ease. He knows his stuff from a scientific standpoint and gives gentle but effective adjustments. 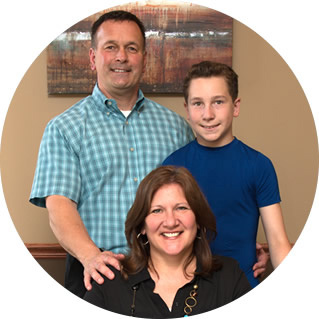 Dr. Goyke was able to see us right away and the care and advice he provided was very helpful! Doctor Goyke is very impressive, after just 2 visits I am already feeling relief from back pain that I have suffered with my entire adult life. Excellent care. My back felt 100% better after the 1st visit. I should be good as new soon. The Dr is extremely easy to talk to. I felt very comfortable and at ease during the visit. I had a lot of pain in my back and I couldn’t walk easily and now I am very grateful to Dr. Goyke, my pain is 99 percent gone. I’m much better now! Dr. Goyke is very professional and explains everything he is going to do and why. He listens to you intently and does not rush. His office is very clean with up-to-date equipment. Always returns your calls and I recommend him highly. Thanks for always taking care of our family! !